The construction industry in the UK accounts for the use of 295 million tonnes of virgin material per year, displaces 22 million tonnes of industrial 'by-product' by industrial ecology each year and produces approximately 150 million tonnes of construction and demolition waste annually. Of this, 46 million tonnes is recycled for use as building products, in road construction, or land reclamation thereby reducing the amount of material that is landfilled and reducing the need for virgin materials in new construction. 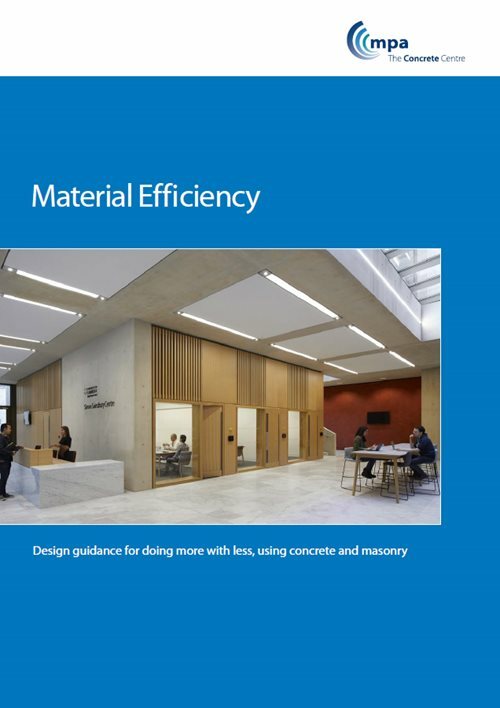 Due to the flexibility and adaptability of concrete, seemingly redundant structures can often be stripped back to their core and then rebuilt to new, contemporary specifications. If a building has to be demolished, then it provides a potentially rich source of recycled aggregate (RA) for a range of applications..
With a growing commitment to recycling construction waste materials, there is now little evidence that any hard demolition and construction waste is sent to landfill (ii). Recycled and secondary aggregates account for 28 per cent of the total market: this is the highest for all countries in Europe. A specific subset of recycled aggregates is recycled concrete aggregates (RCA) where the masonry content is limited to not more than five per cent. The performance characteristics of RCA are better than RA and consequently there are fewer restrictions on the use of RCA in concrete. Provision for the use of RCA in concrete is given in BS 8500-2. About 75-80 per cent of secondary and recycled aggregates are thought to end up as sub-base and fill, including use in road building and airfield pavements. However, the concrete industry actively utilises industrial ecology in the production of modern concrete products due to concrete's inherent inert nature. The constituents of concrete can be recycled materials, and concrete itself can also be recycled; these materials are usually available locally. Concrete pieces from demolished structures can also be reused to protect shorelines, for example in gabion walls or as rip rap. Many formwork options are reusable at the end of their life. About half of all concrete produced in Britain is reinforced and unlike structural steel the reinforcing steel made in the UK is made entirely from recycled steel, which itself can be recovered for reuse at the end of the building or structure's life. Although steel manufacture is an extremely energy-intensive business, the energy needed to produce one tonne of reinforcing steel is as low as half of that needed to make one tonne of structural steel from iron ore. Many cement plants burn waste-derived fuels such as spent solvents, used oils and tyres. Every year the UK produces 400,000 tonnes of waste tyres, posing a significant environmental problem. Legislation prevents the dumping of tyres in landfill and currently around 40 per cent of waste tyres are recycled into re-treads, all-weather surfaces and other uses, but that still leaves 28 million tyres with seemingly nowhere to go. Used tyres make an ideal kiln fuel for the production of cement, without any adverse environmental effects. Kiln temperatures are so high that tyres burn without fumes or flame and what's more the residue from burning tyres can be chemically treated and reused again as fuel. The obvious pay-off from burning tyres is the fossil fuel and carbon emissions saved. It is estimated that the UK cement industry currently consumes 5.6 million waste tyres. Trials are also underway with other alternative fuels in cement making, such as recycled liquid fuel, inert processed sewage pellets (PSP) and packaging waste. Used tyres have even been recycled into concrete as they contain steel fibre, according to recent research sponsored by the Department of Trade and Industry (DTI). The research found that recycled steel fibre (which is cheaper than conventional steel fibre) leads to an increase in concrete's strength, ductility and toughness, making it suitable for a range of specialised applications such as impact and acoustic barriers. Recycled concrete as aggregate will typically have higher absorption and lower specific gravity than natural aggregate and will produce concrete with slightly higher drying shrinkage and creep. These differences become greater with increasing amounts of recycled fine aggregates. The chloride content of recycled aggregates is of concern if the material will be used in reinforced concrete. The alkali content and type of aggregate in the system is probably unknown, and therefore if mixed with unsuitable materials, a risk of alkali-silica reaction is possible.